A little update for everyone about how the internet has grown, it really puts things into perspective. I found this list today posted on a forum that I like to visit. Enjoy them. I have amended one of the facts (fact 10) because our fact expert ( Wrathie ) busted it as a myth. 1. A rat can last longer without water than a camel. 2. Your stomach has to produce a new layer of mucus every two weeks or it will digest itself. 3. The dot over the letter “i” is called a tittle. 4. A raisin dropped in a glass of fresh champagne will bounce up and down continuously from the bottom of the glass to the top. 5. A female ferret will die if it goes into heat and cannot find a mate. I wasn’t recently emailed this and found it to be fascinating. Basically, it’s a large list of how things use to be back in 1909 — only 101 years ago — in comparison to today. I was very surprised myself. I in no shape or form wrote this list by the way. 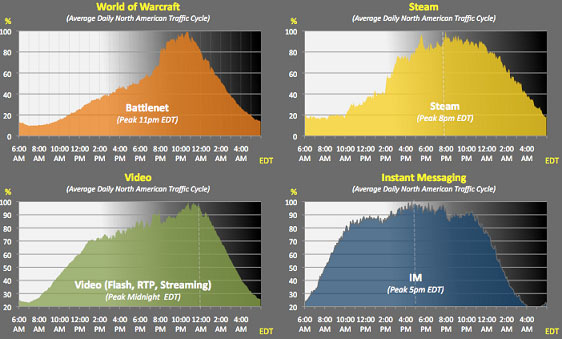 It would appear that loads of people enjoy their WoW during these times as well as coms CounterStrike!